For the last few weeks I have been in major spring cleaning mode. And instead of just de-cluttering, I am "de-owning" a lot of my stuff. I found this concept in an article that I happened upon and it really made sense to me. The author states, "Owning less is far more beneficial than organizing more." Isn't that the truth! It feels so great to simplify and get rid of things that are just taking up space. 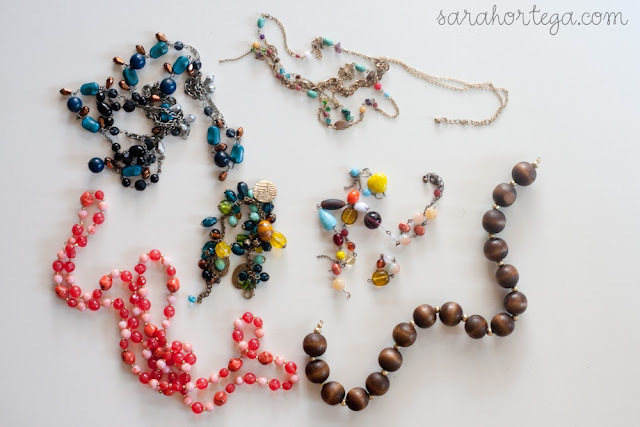 Recently I went through my jewelry and picked out some pieces that were broken or that weren't being used anymore. Before I tossed them in the Goodwill pile I put them aside to see if I could up-cycle the beads. 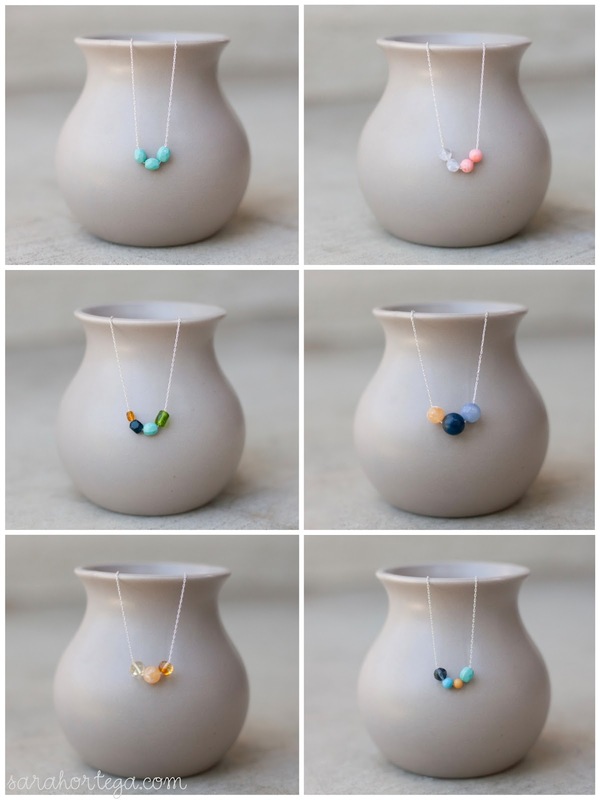 The result is these very sweet and simple necklaces. They are a cinch to make and only take a few minutes. Once you see just how easy these are to make you'll want to rummage through your own jewelry stash and create your own. 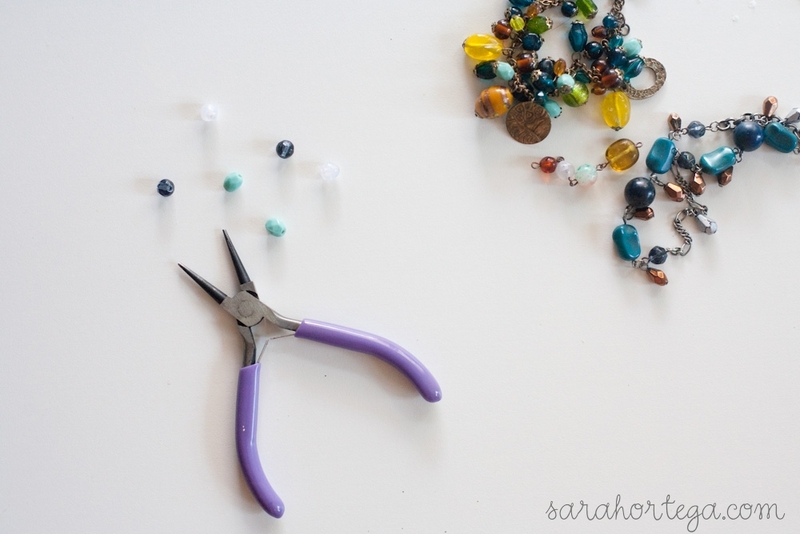 Start disassembling some beads from your jewelry. You can use either pliers or a wire cutter to do this. 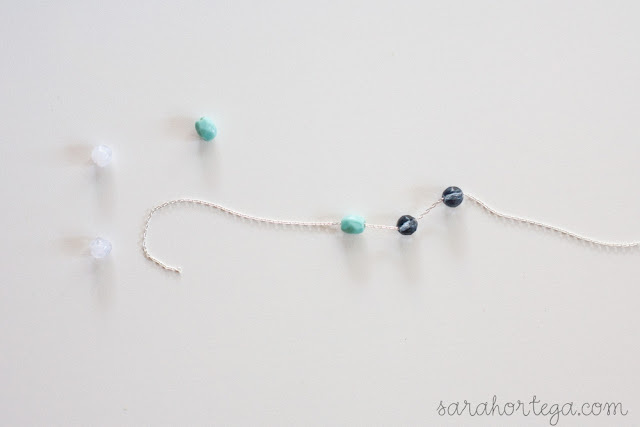 Now simply slide the beads onto the chain. Next, just apply the lobster clasp and jump ring to the ends of the necklace. *Here is a helpful tip. You might find that when using such thin chain, the jump rings will not fit through the very small links. 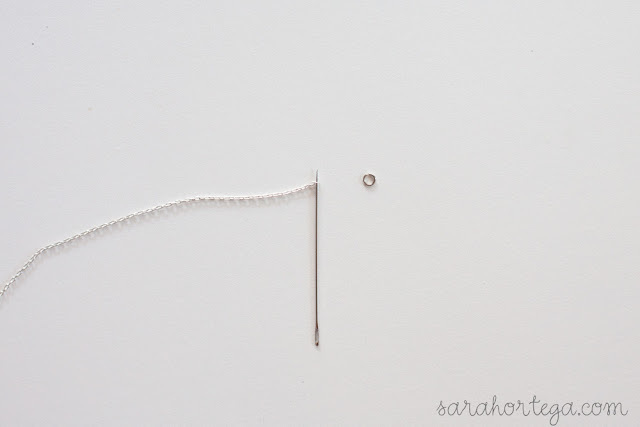 If this is the case, you can use a needle to gently widen the link and give it a more circular shape, allowing the jump ring to fit. And that's it! 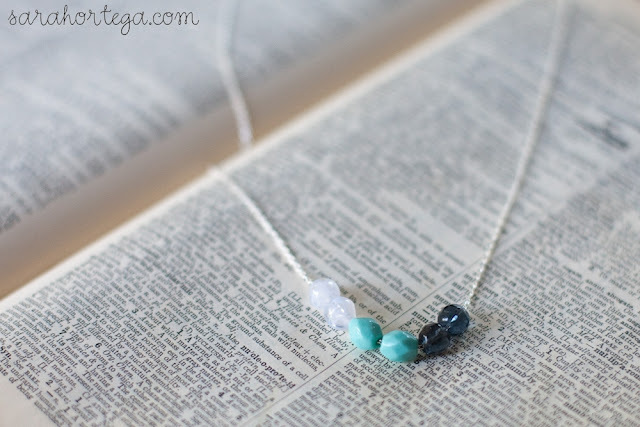 A lovely ombre up-cycled necklace that took just minutes to make. 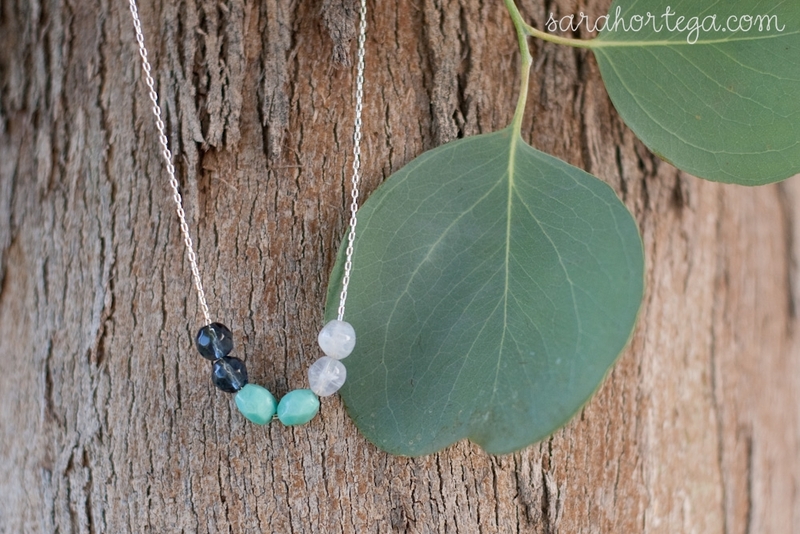 Here are a few more up-cycled necklaces that came out of my pile of old, broken jewelry. I am particularly fond of this one. 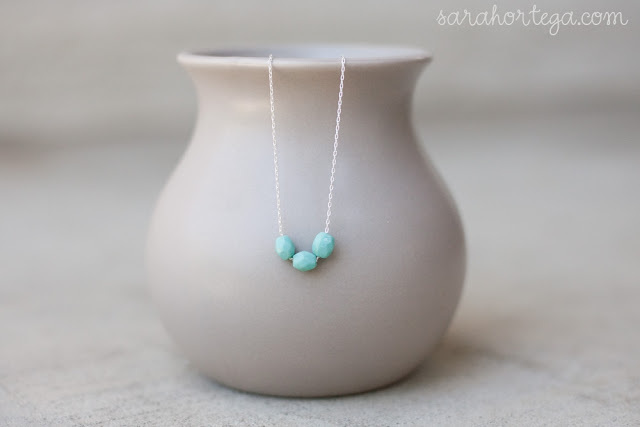 Such a simple necklace but it is one of my favorites to wear. I hope you're inspired to go through some of your old things and give them new life! Love these! Where do you buy your chain? I looked at a craft store recently (when I made your nest necklace!) and had a hard time finding some that didn't look cheap. I actually found this thin chain at Michaels. The brand is bead landing and they sell it in 72 inch packs. I love doing this...a lot of jewelry I can't seem to let go of even if it's broken or I never wear it. So I've started making new pieces from them like you've done! Loving this idea, oh the possibilities. I was wondering the same thing as Kristi, where do you find your dainty, pretty chain? I'm glad you like the idea and who doesn't have broken/unused jewelry just lying around right? I found this thin chain at Michaels actually. The brand is bead landing and they sell it in 72 inch packs. they are so beautiful.I love your style, simple and delicate. So glad that I found your blog through tip junkie! 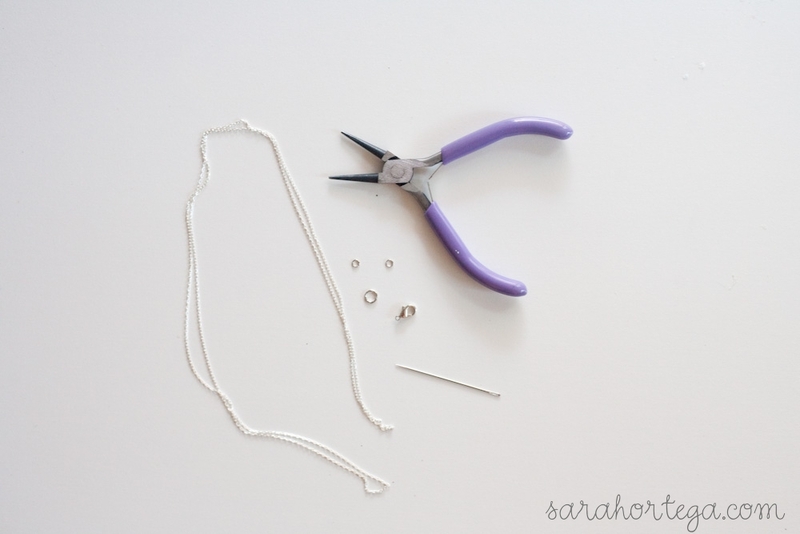 I was making your bird's nest necklace and I am having a bit of trouble keeping the wire in place,any suggestions? By the way, LOVE your blog!!!! Hi! New follower! Love these necklaces!